Comparison of exchange trading platforms. ATAS vs Metatrader. Convenient and fast software is vitally important for any trader. Traders need unique indicators, which would send signals much faster and more accurate than with other traders. They want to trade directly from the screen in one touch and work with visually convenient interface, which would not tire the eyes in the end of a trading session. Maximum of flexible settings, which are connected to brokers. And, preferably, free of charge. In other words, traders want a free Ferrari. Is it possible? In this article we will compare the trading and analytical ATAS platform with the most popular MetaTrader 5 (MT5) platform, which is a favourite platform of the over-the-counter Forex market fans. Fancy a battle between ATAS and Quik? Click the like button in the end of the article and make comments. 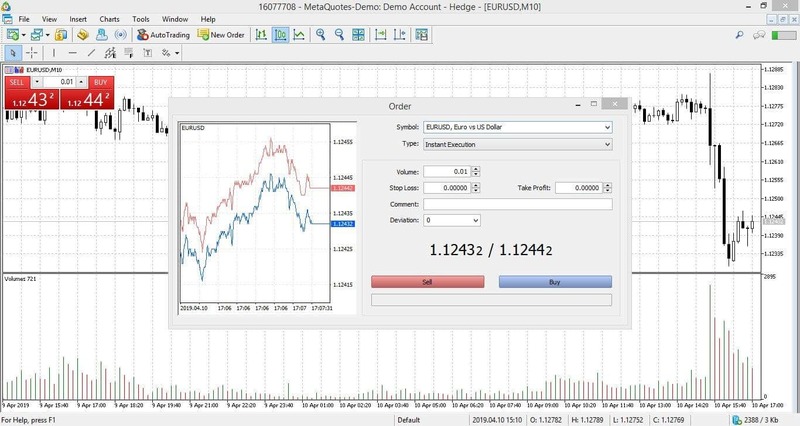 Today we will compare ATAS and an industrial standard for forex dealers – the MetaTrader 5 platform. possibilities of one touch trading. While comparing, we will use the EUR/USD currency pair in MT5 and EUR/USD futures (EDM9) in ATAS. MT5 is from the left and ATAS is from the right side. Minimalism to the right and overload to the left immediately catches the eye. convenient graphical bonuses in the drop-down menu – a reel, various highlight forms and mouse crosshair choice. MT5 menu looks like a conservative office application from 1990s. Some buttons have duplicates, but there is a benefit – the panel interface could be adjusted. 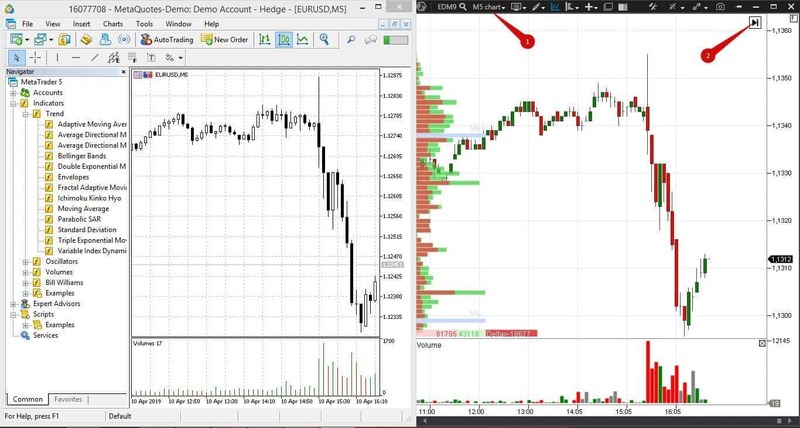 There are few graphical bonuses – Fibonacci lines, channels and levels. Convenient interface is subjective in this case but ATAS looks more modern. There are 25 footprint variants and 14 chart types built into ATAS, only 2 of which are connected with time. MT5 has time charts only and does not have footprint at all. Time independence allows ATAS users ignoring the market noise and analyzing a situation under a different angle, which is a competitive advantage for a trader. Need an example? We selected the 15-minute chart in MT5 to the left and the rangeUS chart, which does not depend on time, in ATAS to the right. The right chart is clearer, it has less market noise and it is easier to control the downward movement in it. A possibility to try various charts expands the number of trading strategies and niches. For example, wave indicators send a lot of false signals in time charts and work perfectly in renko charts. In order to make profit in trading, it is important to see a situation differently from the majority of minor traders. ATAS provides a choice, while MT5 restricts opportunities. Cluster analysis is a relatively new type of analysis – it exists for 15 years only. While the technical analysis focuses mainly on the price movements, the cluster analysis considers a combination of the price, volume and order flow movement. Besides, clusters show all three components in the real-time mode. Traders can see at which price level the maximum volume is formed and who exerts a bigger pressure – aggressive sellers or buyers. Standard candles or bars will never tell you what takes place inside of them. There is no cluster analysis in MT5 and we cannot show you a chart for comparison, that is why we will show you what ATAS has. Here we have the 15-minutes chart of a EUR/USD futures (EDM9) in the form of Bid*Ask volume profile and the cluster statistics indicator. The black rectangle marks the reversal candle at the day’s high. Its delta is negative. The maximum volume levels consistently move down after this candle (marked with numbers 1-4). It confirms the pressure of sellers. A failed bounce at 12:30 is marked with a red rectangle. And, finally, a huge volume passed at 12:30 (in the candle marked with a green rectangle). Buyers entered and reversed the price at the day’s low. The cluster variant of display clearly shows who, where and how influenced the price and what happened next. This information is extremely important for beginner traders in order to develop correct understanding of the market. Beginners can play with the moving average periods and draw flags and wedges in the chart as much as they like, but what happens with demand and supply is of decisive importance for trading efficiency. And such indicators as delta or cluster statistic become critical. Let us compare indicators of both platforms. MT5 has a huge number of indicators – much bigger than ATAS has. But there is a serious drawback – all these indicators are connected with the classical technical analysis only. Such indicators as MACD, RSI and Momentum do not provide a competitive advantage, because all traders use them. However, MT5 has a built-in software market. The platform users can download special indicators with its help. However, we failed to find indicators similar to those that ATAS has. Apart from the technical analysis indicators, ATAS has unique indicators, which are connected with the cluster analysis. For example, big trades, dynamic levels, horizontal volumes, market profiles and others. Moreover, some indicators have special auto-filters for beginners in order to get working settings fast and easy. Assess advantages of these indicators in the following chart. We use Big trades and Stacked Imbalance. The Stacked Imbalance indicator highlights a significant excess of bids or asks at several consequent price levels. That is, the indicator shows where the most aggressive sellers or buyers “got together”. As a rule, these levels become the resistance or support levels. The price can test them and then the traders have a possibility to use limit orders for planning trades. Do you agree that it is more convenient to see these levels and use them in your trading strategy than to make guesses about them? It seems incorrect to compare progressive indicators of ATAS and ordinary moving averages of MT5. Let us compare standard technical analysis indicators for a fair overall assessment. Let us take the pleasing to the hearts of scalpers Heiken Ashi – it is available both in MT5 and ATAS. We couldn’t have added anything interesting in MT5 except for the volume. By the way, it should be noted that the volume in MT5 is not the volume of exchange trading – it is the volume, which is broadcast by your broker. Where from? Ask the broker’s technical support – can they give you an answer? We selected the tick chart in ATAS and added the delta and open interest indicator, which is broadcast online by the Moscow Exchange only. Forex fans restrict themselves, since they have access neither to traded exchange volumes nor to the open interest. The color palette pleases the eye in MT5. The information content pleases the eye in ATAS. We can see registration of profit by short positions, marked with a black rectangle and number 1, after the price fall in the beginning of the trading session. Reduction of the open interest together with the positive delta tell us about closing the already existing positions, in other words, about the fact that sellers buy futures in order to close their short positions. Number 2 marks growth of the open interest and negative delta. It means increase of new short positions and money inflow. The price will go further down under the pressure of new sellers and it will be profitable and relatively safe to open short positions at this level. Here we not only trade by standard changes of colors of the Heiken Ashi candles, but we also reduce the risk level monitoring actions of other market players. Moreover, we do not fall into a trap of opening long positions during registration of profit on short ones. Follow the smart money and never go against it. Most probably, you met this phrase in articles on trading. ATAS will show you what the smart money does, while this information is not available in MT5. 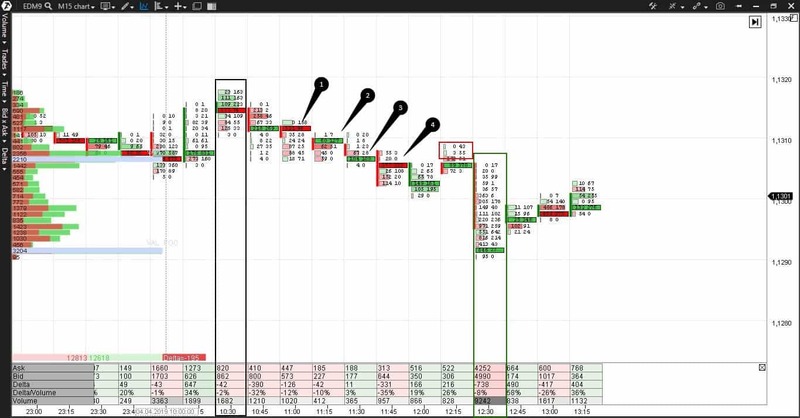 The order book and Time and Sales tape are significantly functionally and visually different in MT5 and ATAS. Remember that ATAS broadcasts official exchange price quotes and has a possibility to connect to reliable trading data suppliers. 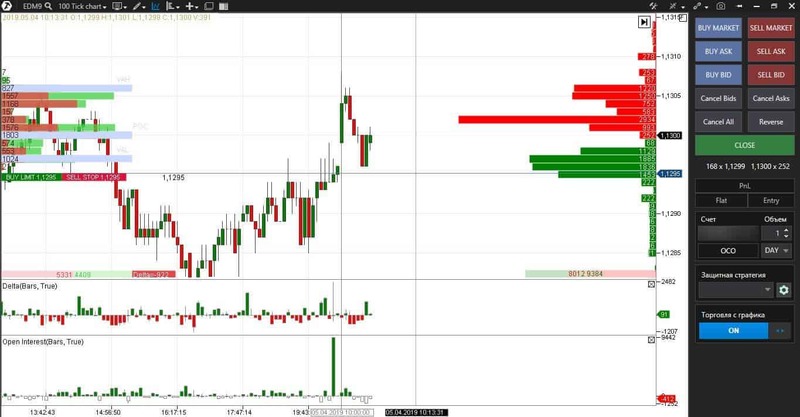 ATAS shows you the traded volumes of the current and previous days. You can post orders directly in the book, which is called the Smart DOM. Functionality of this powerful instrument deserves a separate article. 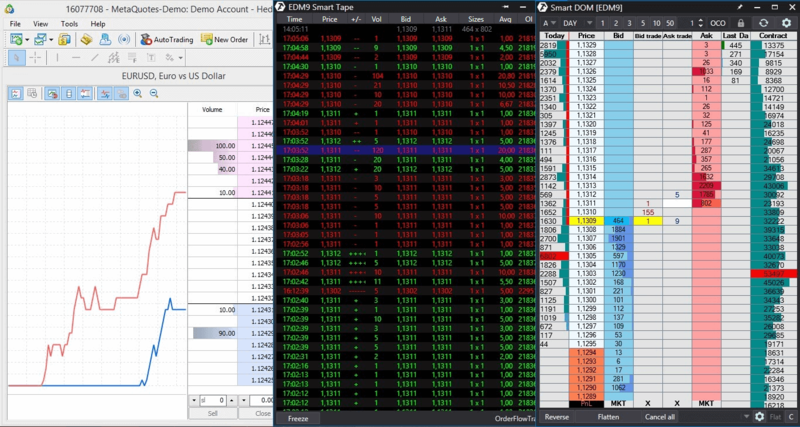 MT5 broadcasts price quotes and spreads of individual brokers on FOREX. The developers write that one touch trading is available both in MT5 and ATAS. Let us use charts to check whether it is really so. ATAS has a choice – to trade from the chart in one touch with the right or left mouse button – chart trader. The traders, who want to secure themselves against emotional or incidental trades, have a possibility to trade with additional confirmation through a special panel. Limit orders could be posted directly in the chart at the required price level. The most important things in ATAS are convenience, speed and possibility to choose. MT5 has a red-and-blue one touch trading panel in the chart, but the functionality is much poorer. A trader can set the position size only. Connecting trading accounts, brokers and traded instruments. MetaTrader 5 is certified for CME and MOEX trading, but the majority of users trade on Forex. We would like to draw your attention again to the fact that, in fact, Forex trading is trading against your broker, who posts spreads. ATAS is connected to reliable data suppliers for trading on CME and MOEX. MetaTrader is much older than ATAS, that is why you can easily find books, instructions and all sorts of strategies of working in this system. However, there is a risk of using materials of doubtful quality. It is much simpler with ATAS: official blog, YouTube channel and groups in social networks. New articles and videos are constantly added to the blog and video channel. Support in ATAS is carried out by Skype or electronic mail. Specialists are available during trading sessions and answer your questions quickly and professionally. Support in MT5 is carried out by electronic mail. Possibility to order a new indicator. A huge number of trading forums offer you to buy or develop for you a required indicator under MT5. It depends on a developer and quality of work statement how properly it would work. The dedicated team of the ATAS developers develop indicators for the platform. They realize your idea and integrate it into the system with 100% guarantee of performance efficiency and correction of possible errors. If a customer agrees, his indicator will be available for all ATAS users. Examples of such indicators: Stacked Imbalance, OI Analazer, and RTIndikator. You can successfully trade currency pairs and CFD in MT5. If you prefer to work in the old fashion and you are happy with the standard technical analysis and interface of the previous century, MT5 is for you. If you want to try something, which is new, advanced and which will help you to be ahead of many other traders, ATAS fits you better. The cluster analysis emerged just 15 years ago and many years will pass before it becomes as popular as the technical analysis and all these years you will be making money on ignorance of other traders. Do you prefer to drive a comfortable and fast automobile with auto transmission or you like the manual transmission better? You are the boss. You can try ATAS free of charge. But watch out. Good software is addictive. Is it realistic to make a living trading stock? A simple method to read stock price quotes with the help of clusters.